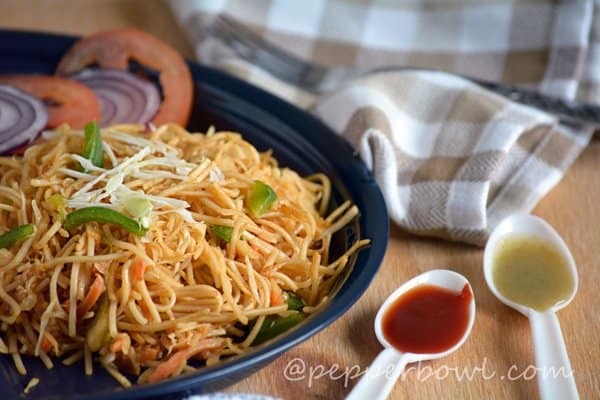 ‘Easy Spicy Szechuan Noodles Recipe | Indo Chinese Vegetarian Recipe’ is Chinese recipe, modified to Indian taste. If you cooked the noodles to the correct firm texture, then the stage is yours and you can do any type of interesting drama here. Before even I thought of posting this recipe for my blog, I double checked with the spelling for Szechuan Noodles. I need to admit that it is little tricky. But the recipe is not that much tricky, this vegetarian version of spicy Szechuan noodles is even perfect for bachelor’s cooking and a perfect lunch box recipe too. I can’t wait for myself till taking these snaps. I just switched off the camera, grabbed the plate and fork, drizzled the sauce, wow. it’s true that the spiciness is hitting the tongue. I do not know, how the real authentic Chinese recipe will be for this Szechuan noodles. But everyone is customizing the recipe according to their taste. If you cooked the noodles to the correct firm texture, then the stage is yours and you can do any type of interesting drama here. Szechuan Chicken is the best complimentary drink to go with this spicy noodles. For this Szechuan Noodles Recipe, I went with ready made the Szechuan sauce, which made my work much easier. The recipe for this spicy Szechuan noodles customized with easy, simple procedures. 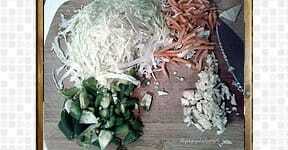 With shredded cabbage green peppers, carrot, Szechuan, hot, green sauces. With the same process, you may also make Szechuan Fried Rice, a wholesome dinner recipe which is also easier to make. 1. 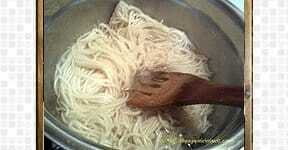 Cook noodles in the boiling water for about 3-4 min, or until the noodles are 3/4th done. Immediately drain the water and run cool water and drain that cool water too. Keep it aside, till we look into the other process. 2. Shred the cabbage, julienne the carrots, capsicum like match sticks, Chop garlic. 3. In a big pan or wok in the high flame, add oil with chopped garlic. Let it cooked slightly. Then add the drained noodles, add the three sauces, Szechuan, green chili and red chili sauce. Stir everything together in high flame, till the noodles get coated with the sauces evenly. Then add the prepared veggies and cook it for another 2-3 min in high flame. Serve Szechuan Noodles hot with tomato sauce and chili sauce. 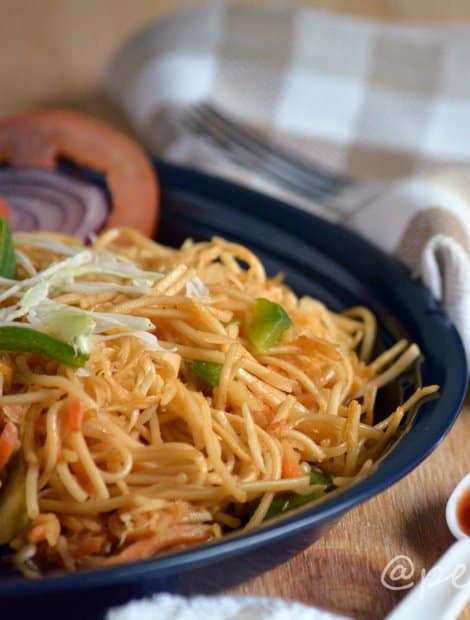 Easy Spicy Szechuan Noodles Recipe | Indo Chinese Vegetarian Recipe' is Chinese recipe, modified to Indian taste. Cook noodles in the boiling water for about 3-4 min, or until the noodles are 3/4th done. Immediately drain the water and run cool water and drain that cool water too. Keep it aside, till we look into the other process. Shred the cabbage, julienne the carrots, capsicum like match sticks, Chop garlic. In a big pan or wok in the high flame, add oil with chopped garlic. Let it cooked slightly. Then add the drained noodles, add the three sauces, Szechuan, green chili and red chili sauce. Stir everything together in high flame, till the noodles get coated with the sauces evenly. Then add the prepared veggies and cook it for another 2-3 min in high flame. Serve with Indo-Chinese side dishes like chili chicken, garlic chicken, gobi Manchurian. 1. 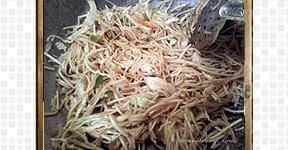 Add shredded chicken to make Szechuan chicken noodles. 2. The same recipe can be used to make Szechuan rice. Dunno how i missed ur space, cant take my eyes from those noodles,irresistible. 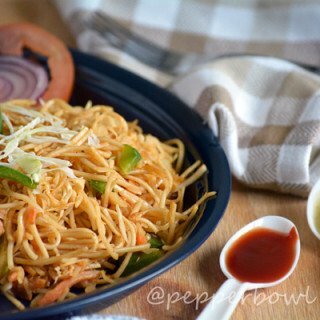 Beautiful clicks and delicious noodles recipe!